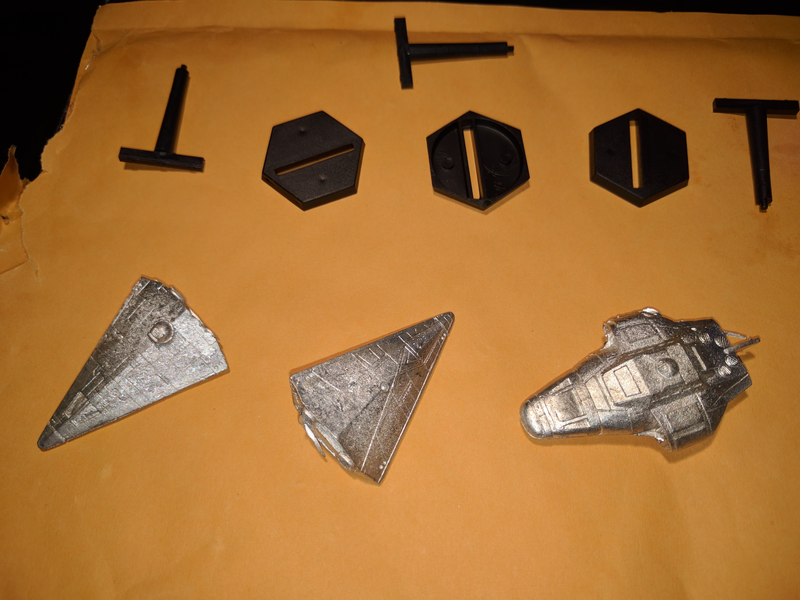 Ship miniatures for Traveller are somewhat rare. After decades of using little cardboard chits, I finally decided to take the plunge and buy some. Ad Astra currently has a license to produce Traveller ships. While they make capital ships for use with Power Projection: Fleet, among other things they also sell a Beowulf-class Free Trader, and that stalwart of the space lanes, the Imperial Scout. Those are the two models I purchased, and the subject of this review. They aren’t in scale with the RAFM Traveller ships from the 90s (Ad Astra’s are larger), but they’re not so far off that they can’t share a table. Well, unless you’re a stickler for details like that. I’d already plunked down my money and purchased a bunch of the RAFM ships from a retailer that had quite a few in stock. They averaged around $7.00 each, or for the smaller ones, two or three models for between $7.00-$9.00 a pack. But when they looked behind the counter, they didn’t find any Free Traders or Scouts. And that’s why I went to Ad Astra next. The Ad Astra Beowulf costs $17.95, while a two-pack of Scouts will also run you $17.95, about $9.00 per Scout. So while the Beowulf is quite expensive, the Scouts aren’t priced entirely out of line. 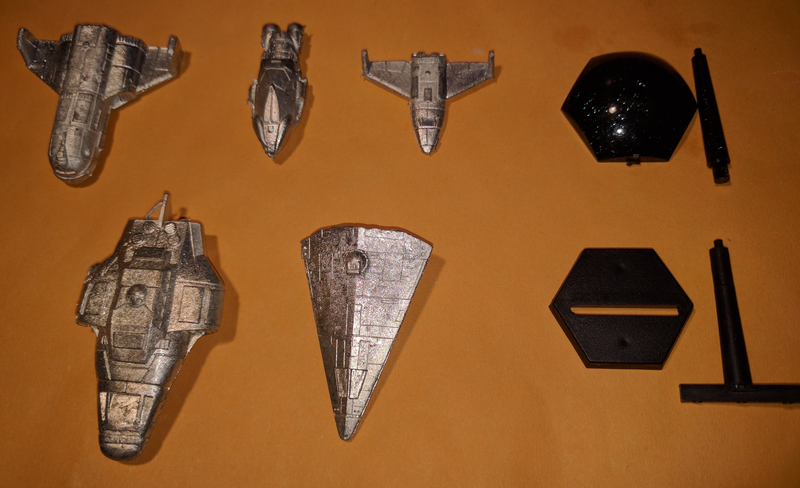 These are the three ships I purchased from Ad Astra, along with their stands. I’ve left the flash on for the photos; this is how they arrived. The Ad Astra ships are made of a light-colored, lightweight metal. [lead-free pewter, according to the Ad Astra website –Ed.] Their surfaces show more fine detail than I expected. I don’t know how much of that will show through a coat of primer, and then a coat of paint, but it’s the thought that counts. There is some flash, and visible seams, but nothing that looks problematic to deal with. The Scouts have a kind of ridge on the edge of their leading surfaces. I’m not sure why, but it looks OK. Plastic stands are included. They appear very flimsy, and the extremely short and narrow peg at the top seems quite ready to snap without much prodding. This would leave the tiny hole in the bottom of the ship plugged up. I think I may have to come up with some other arrangement. Here are the three Ad Astra ships from another angle. Note the ridge along the leading edge of the Scout, visible on the ship to the right. Here’s another angle on the Ad Astra ships, a nice close-up. 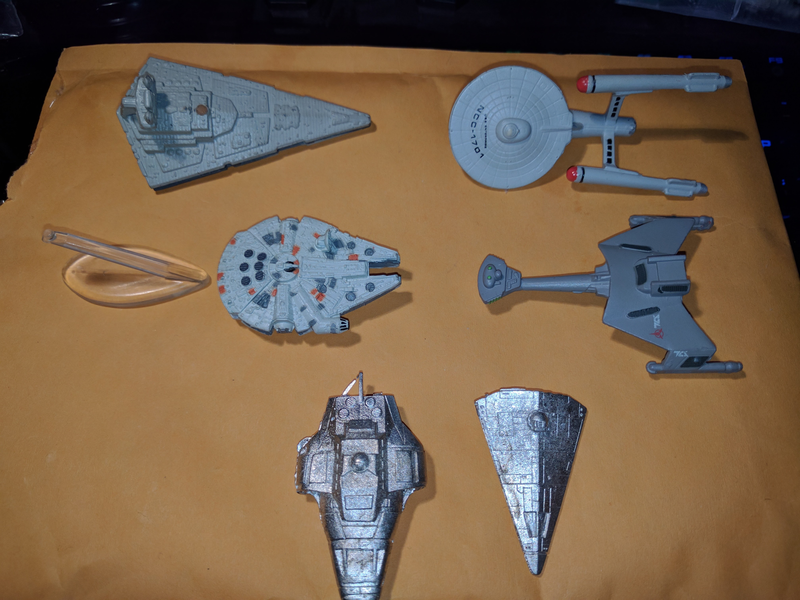 For comparison: Along the top are Micro Machine ships, Star Wars on the left, and Star Trek on the right. Pre-painted, as they came. Obviously the larger ships are totally out of scale, but the Millenium Falcon is comparable in size to Ad Astra’s. The stand is one that came in my huge bag of Micro Machines that I got on eBay. Stylish, but I haven’t tried gluing anything to one yet. For comparison: Two Ad Astra ships on the bottom row, Beowulf-class Free Trader on the left, then the Scout, along with their stand. Top row, from RAFM, from left to right, a Subsidized Merchant (note how much bigger the Beowulf is), a Yacht (really tiny compared to Ad Astra's ships), and a Shuttle, along with one of the stands that came with the RAFM ships (it’s really sturdy, and has neat bright flecks in the plastic). A while back I also purchased Power Projection: Fleet from Ad Astra Games. I don’t remember any issues with my order. But in the interest of full disclosure, I placed my order for these Traveller ships on May 2nd, after asking about the scale. I followed up two weeks later, and they hadn’t been shipped yet. Two more weeks went by and they still hadn’t arrived. I made another inquiry, but received no answer. After another five days, I inquired again. At that point I was informed that a replacement shipment would be sent. I asked for and received a tracking number, and the order arrived without further issue on June 12th.